Over the past week I had three friends ask for a chocolate cake recipe. 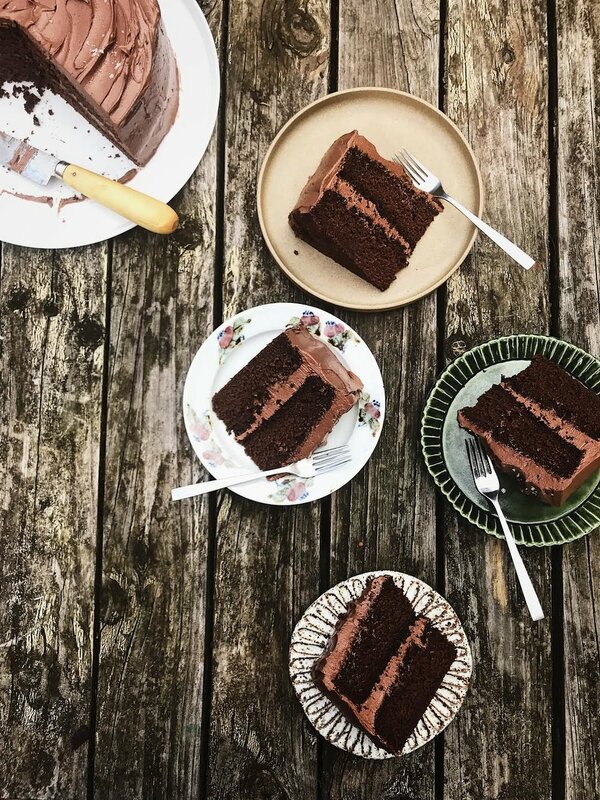 I have a honey chocolate cake, a rosemary chocolate cake and an almond chocolate cake recipe floating around but not that rich fudge-like layered kind with a tender crumb and decadent frosting. I decided it was high time that I wrote a recipe for that exact kind of cake. I've only made this cake once, unlike many of the recipes I post here, but I am rather confident you will love it and as always, any feedback is welcomed. I've made the cake into two layers which feeds a crowd very comfortably. Buttermilk, which is quite essential in this recipe can be replaced by making a quick and easy version at home. For this recipe pour 300ml of milk into a jug or bowl and squeeze in 2 tablespoons of lemon juice or vinegar. Stir gently then allow to sit for 5 minutes. It should have thickened substantially and perhaps even curdled a little which is more than fine. If it is still closer to milk in viscosity, add another tablespoon of lemon juice or vinegar and check again in 5 minutes. I love the combination of sea salt and chocolate, it really cuts through the richness of the cake. A layer of caramel in the middle could be added, as could some raspberries or jam! I've used a combination of sugars here, truthfully I had run out of caster sugar, but the result was perfect. I dare assume simply caster sugar would yield similar results so feel free to play around with the sugar ratios. Be sure to buy the best cocoa powder you can afford – it should be richly dark in colour. I usually buy mine from The Essential Ingredient. Preheat the oven to 180C and grease and line two 20cm round tins with butter and baking paper. Set aside. For the cake, place the butter and sugars together in a large bowl and beat in an electric stand mixer on a medium speed until pale and fluffy, around 3 minutes, scraping down the sides with a spatula as necessary. (This can also definitely be made by hand, just be sure that your butter is very soft.) Add in the eggs, one at a time, mixing well between each addition. Reduce the speed to low and pour in the buttermilk, vanilla extract and coffee and mix well. The batter may split at this moment, but as soon as you add the dry ingredients, it will all come together. Slowly add in the flour, cocoa and salt and mix until just combined. The mixture should be slightly wetter than you're average cake batter. Divide the batter equally into the prepared tins and bake in the preheated oven for 35-40 minutes or until the top of the cakes spring back when gently pressed. Allow to cool in the tin. Meanwhile for the frosting, melt the chocolate in a heatproof bowl set over a pot of simmering water but not touching. Allow to cool briefly. Using a stand mixer fitted with a whisk attachment, beat the butter, icing sugar, cocoa powder and vanilla in a large bowl until thick and fluffy. With the mixer on medium, stream in the slightly cooled melted chocolate and continue to beat until thick and voluminous. Set aside. Remove the cooled cakes from the tins and if the cakes have peaked during baking, trim the cakes to make them as flat as possible. Place one of the cakes on a serving plate, with the base of the cake (which should be naturally flat) onto the plate. Place a big dollop of the frosting onto the middle of the cake and spread it out evenly towards the edges. Sprinkle with a little sea salt. Sprinkle some more sea salt on top of the cake and serve. *The crumb is quite moist so you can do a crumb coating first if you would like. This means applying a very thin layer of frosting onto the cake and refrigerating the whole cake for at least 30 minutes before applying the final and thicker layer of frosting. All of the crumbs become trapped in the first chilled layer of frosting so when you finish the cake, the crumbs stay put and don't drag into the frosting!